This paper reports results of a natural field experiment on the dictator game where subjects are unaware that they are participating in an experiment. Three other experiments explore, step by step, how laboratory behavior of students relates to field behavior of a general population. In all experiments, subjects display an equally high amount of pro-social behavior, whether they are students or not, participate in a laboratory or not, or are aware of their participating in an experiment or not. This paper shows that there are settings where laboratory behavior of students is predictive for field behavior of a general population. I would like to thank Aurélien Baillon, Han Bleichrodt, Enrico Diecidue, Dennie van Dolder, Ido Erev, Emir Kamenica, John List, Steven Levitt, Wieland Müller, Charles Noussair, Rogier Potters van Loon, Drazen Prelec, Kirsten Rohde, Ingrid Rohde, three anonymous referees and participants from seminars at the Erasmus University Rotterdam and the University of Chicago for their useful comments. Special thanks to Jan Potters and Peter Wakker for some significant contributions. I would like to thank Thibault van Heeswijk and Bart Stoop for their excellent research assistance. Finally, I would like to thank ERIM for financial support. The online version of this article (doi: 10.1007/s10683-013-9368-6) contains supplementary material, which is available to authorized users. Franzen, A., & Pointner, S. (2012). The external validity of giving in the dictator game: a field experiment using the misdirected letter technique. 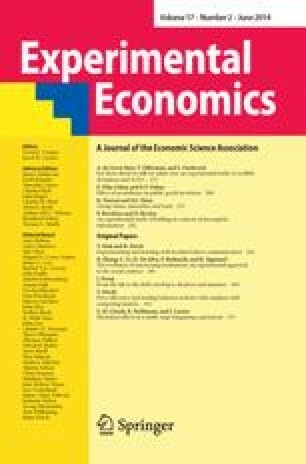 Experimental Economics. doi: 10.1007/s10683-012-9337-5. Winking, J., & Mizer, N. (2013). Natural-field dictator game shows no altruistic giving. Evolution and Human Behavior. doi: 10.1016/j.evolhumbehav.2013.04.002.